Mass protests erupted on April 1 by demonstrators demanding elections to remove President Nicolas Maduro. 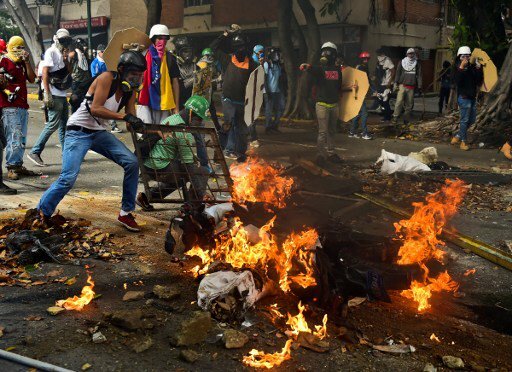 A young man died Friday after he was injured in violence as looting broke out in impoverished Venezuelan cities, an official said, bringing the toll from unrest in more than a month of anti-government protests to at least 36. Anger boiled over Friday in the western municipality of Rosario de Perija, where young protesters burned, pulled down and then smashed a statue of former president Hugo Chavez, Maduro’s late predecessor and mentor, according to video posted on social media showing the incident in a public square. However, senior opposition leader Henrique Capriles said on Friday that 85 mid-ranking army officers have been detained for opposing moves to crack down on protesters. Maduro’s opponents called for women to march on Saturday dressed in white, a traditional show of defiance against what they brand a repressive government. Capriles said the opposition will take no part in the constitutional discussions. The celebrity Venezuelan conductor Gustavo Dudamel, director of the Los Angeles Philharmonic, added his voice to calls for an end to the violence on Thursday. He called for Maduro to “listen to the voice of the Venezuelan people”, in a message posted on Facebook.